This is the view from my bedroom window. 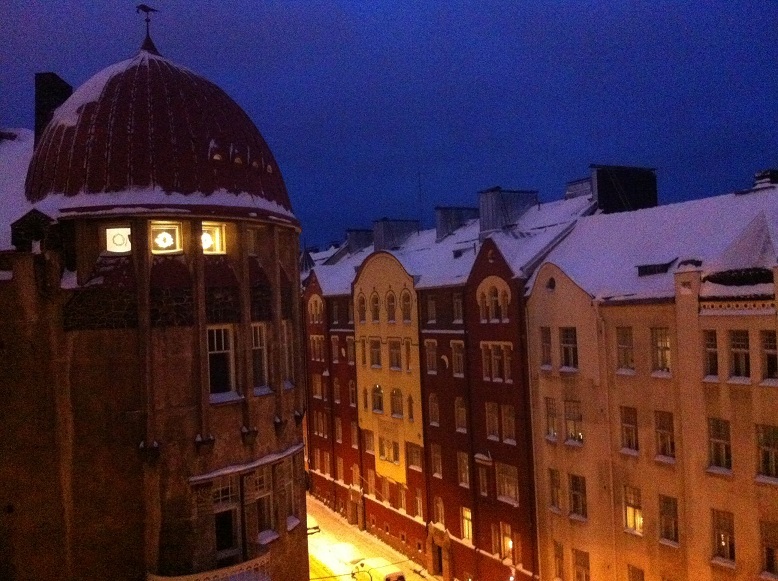 There is a lovely l'heure bleue in Helsinki every afternoon in the wintertime. The blue hour, you know, is the period of twilight each morning and evening where there is neither full daylight nor complete darkness. The time is special because of the quality of the light and the wonderful blue hue at the sky. It makes me love the Finnish winters so much and enjoy my daily drive home from my work. Many of Helsinki Metropolia's partners think that it is very cold in Finland. They are ashtonished to hear from me that Finland can in the summer often be the warmest country in whole Europe. Winters can be mild, too, and especially in Helsinki region, but we Finns normally like it better with either some snow or lots of snow. It makes the landscape look so soft and bright. This week I hope very much to be able to forget the Christmas preparations for two hours and get to my skies. Crosscountry skiing is something extraordinary and makes the wintertime just perfect for me.